Today I held a presentation at the Swedish System Center User Group client day on topic Microsoft User Experience Virtualization (UE-V) and its integration in ConfigMgr 2012 R2. Great to see such interest in UE-V! Afterwards, the most common question I got was “Does UE-V roam email signatures for Outlook?”. Well, the answer is yes, but there is a big “BUT”! UPDATE May 14th 2014: UE-V 2.1 (currently in beta) include a template fix for this for Swedish and Dutch but still there might be issues for other localized versions of Office. If you are still on UE-V 1.0 or 2.0 you find a UE-V template for roaming the Signature for Swedish Office at TechNet Gallery. 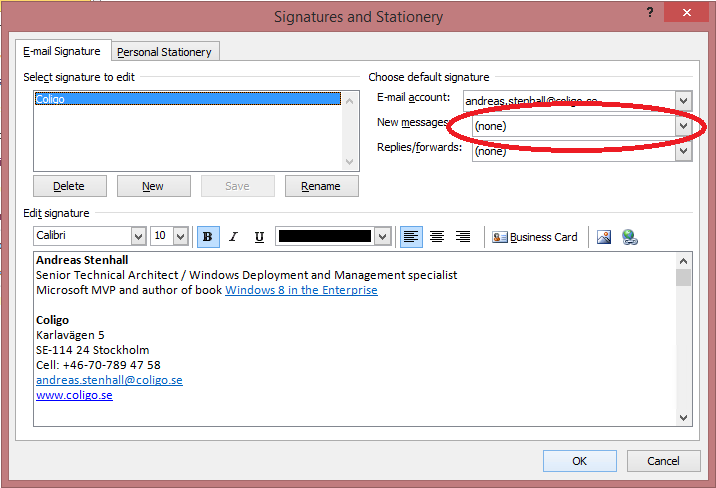 UE-V does roam the email signature but you have to manually set the signature as default in Outlook options > Mail > Signatures when logging into another machine or after reinstalling your own machine. And, there is an issue if you are using a localized version of Office. First an example of how the Outlook email signature is actually roamed when switching to another machine, but note that you must choose to make the email signature “active” on the other machine. And after logging onto a Windows 8.1 machine, the email signature did roam with me, but I as a user must make the email signature active by selecting it in the drop down list for new and/or replied or forwarded messages. This will save and roam all files (email signatures) in the users %APPDATA%\Microsoft\Signatures folder. 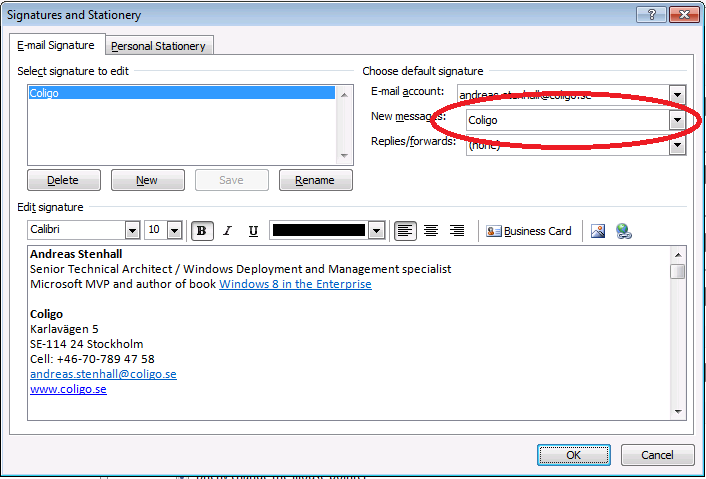 The problem is that on a machine with a localized Office version, the email signature folder located in C:\Users\<username>\AppData\Roaming\Microsoft is not called “signatures” but instead localized to “signaturer” (as I am running a Swedish installation of Office). If you have followed UE-V best practices and put your template files in a network share pointing that out using the UE-V GPO settings, you can just go ahead and edit the template file in the network location replacing “Signatures” with “Signaturer” in my example and the UE-V agents in your environment will by default pick up the new settings within 24 hours. This behavior is the default for both UE-V 1.0 (with SP1) as well as the coming UE-V 2.0 (which is now in beta). Note that changes might occur before UE-V 2.0 is released. UPDATE September 25th 2013: Microsoft has posted a KB article which explains more about why the mail signature is not set as default/active when roaming, see http://support.microsoft.com/kb/2889499/en-us.